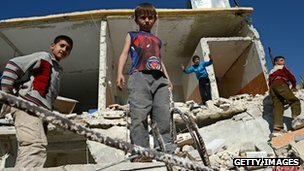 Of the many things destroyed in Syria – jobs, homes, limbs, lives – perhaps one of the most tragic is childhood. In Syria, it has become normal to hear people talking about loss like this. Wael came from Darayya; Husam lost his home in Douma. They no longer go to school or play the same games. These days they are familiar with the sounds of shelling and scenes of death. Childhood itself has changed here. Every day there are images of children killed in the fighting. Ten dead after shelling at a school this week; 10 more in another suburb last week. I remember one long street of wreckage in Baba Amr district, in Homs. Not a single building escaped the shelling – all were burnt or destroyed. No signs of life. The only sounds I could hear were the gunfire and my own footsteps crunching over broken glass. At the end of the road I saw the figure of a boy. He leaned his head out of a narrow alley, curious to know who had come to visit his deserted neighbourhood. I walked up to his house. He, his mother and his aunt were the only people left in the area. His father and brother are still missing. “What do you do during the day? Do you play with your friends?” I asked him. Those traditional questions for children. Then I realised how irrelevant they were in Baba Amr, where there is no sound of laughter, no echo of footballs hitting the walls while kids argue about who is losing. The boy had a shy smile. He said simply: “I do not have friends any more, they all died. They were hit by a rocket and died.” His smile disappeared. He covered his eyes, lowered his head in despair and walked away into the alley. In Syria people do not talk any more about the best education for their children, or plan what they can do with them over the weekend. Or about finding them a new game or book. Instead people talk about death. They see blood and body parts scattered in the streets. And sometimes the pale faces of children – children who might have been laughing, or maybe scared, in the moments before they heard the sound of shelling. Rabie was one of them. He is 12 years old, loves school and wants to be a teacher. He went out one day to buy bread for his family. But a MiG warplane was firing on his neighbourhood in Harasta, east of Damascus. He ran as fast as he could but ended up losing an arm and a leg. When I met him, Rabie was trying to be composed. His eye seemed to be affected too – but there was still a smile on his face. These children are still desperate for normality. Whenever the word spreads in an area that supplies of books and toys have arrived, they gather together, eager to read, paint, sing and dance. Still eager to live. Recently I visited a house, full of children from Homs, Idlib, Hama and Damascus. As soon as they saw the coloured pens and paper, they started drawing homes and revolutionary flags. One stood up and started chanting one of the revolution’s songs. Excitement filled the room. The children lined up clapping and jumping, just as they used to do in street protests. Their hands up, making victory signs.